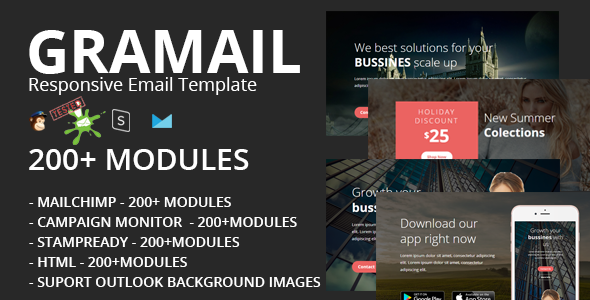 GRAMAIL Responsive e-mail template with 200+ modules, with 200+ modules you have unlimited posibillities design, designed for multipurpose email, online shop email, online store email, portofollio email, and many more. With modern and minimalism design it’s easy for you to communicate with your client or your customer. GRAMAIL compatible with All device and almost all e-mail clients. gramail compaitable wit stampready, mailchimp and campaign monitor..